The dulcet tones of a student string quartet welcomed College community members into the foyer of McCabe Library on the afternoon of Jan. 22. On a draped table, a gigantic cake replicating Parrish Hall stood grandly, replete with details that included not only accurate architectural features of the building but also Magill Walk, Parrish lawns, and Adirondack chairs (even the Big Chair). 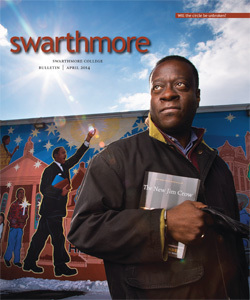 Standing among the burgeoning crowd, Edward Rowe, special assistant to President Rebecca Chopp, murmured, “I can see my office,” pointing toward the far left end (Parrish East) of the culinary masterpiece. 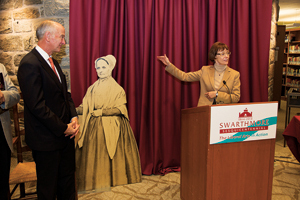 Gil Kemp ’72 (with Lucretia Mott) and President Chopp welcome the celebrants. 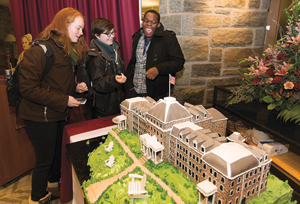 Created by The Master’s Baker of West Chester, Pa., the cake, representing Swarthmore’s first building and heart of the campus, was part of the launch of Swarthmore’s sesquicentennial celebration. Board of Managers Chair Gil Kemp ’72, President Chopp, and Vice President for College and Community Relations and Sesquicentennial Committee Chair Maurice Eldridge ’61 spoke briefly in honor of the occasion, while College co-founder Lucretia Mott, rendered in life-size cardboard cutout, looked on. All present at the launch were treated to tasty cupcakes. Parrish Hall was consumed later that day by students. For more, click here.